This is Clos Lucé (Cloh Loo'-say) a castle in Amboise, a small touristic town along the Loire River. Leonardo Da Vinci spent his last three years here (1516-1519) as a guest of King François the First. The chateau includes 40 models of Da Vinci's visionary inventions, including flying machines and other futuristic modes of transport that were centuries ahead of their time. And of course, there is a replica of the Mona Lisa, whom the French call, "La Jaconde." It was among three paintings he brought with him from Italy. 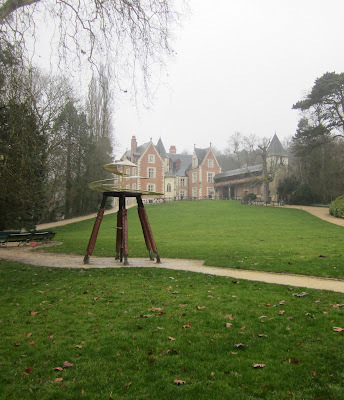 Clos Lucé's also got a gorgeous seven-hectare park that includes 16 giant interactive models and 32 translucent paintings of Da Vinci's most noted artistic works hanging from the trees. There's even a playground for the kids, so it's really a great family place. Not to mention the cool bridges throughout. There's lots to explore, even for the very youngest visitors. It's hard to define Da Vinci. Was he first considered as a painter? An engineer? A philosopher? In the site's gift boutique, I bought a book that focuses on his intellectual thoughts. It contains dozens of his best quotes, including, "Seek help from the one who corrects himself," "Only love can stop hate," "There is nothing that deceives us more than our own judgment," and the sage advice, "Reprove your friend in secret and praise him openly."